With a sigh, he heaved his trunk into an upright position in preparation to sit on it and wait for Celice. Before he could, a voice called out, “Pharazon!” He turned to see a familiar white Lupe waving at him from the window of a Uni-drawn carriage. “Get in before you catch Neomonia!” Celice said, gesturing inside. “Coming!” he replied, dragging his trunk across the wide dock where other Neopets busily unloaded cargo or boarded carriages. He should have brought a scarf, he decided. It had been deceptively warm back in Altador. “Just toss it in the back hatch, there,” the Uni driver, a kindly-looking blue female, said with a toss of her horn. Pharazon did so and then climbed into the carriage, on the seat across from Celice’s. He wiped the moisture from his forehead and tried to dab himself dry with his damp cloak. The Lupe flicked a finger and a flame burst from the tip of her claw. The fire was small, but gave off an unusual amount of heat for its size. “Thanks,” Pharazon said, placing his claws up to it to warm them. “How was the flight?” Celice asked as the carriage lurched into motion. Still holding out the flame, she crossed one leg over the other and watched him over the rims of her spectacles, her bright yellow eyes glistening in the firelight. She looked the same as ever, Pharazon thought. Her white hair was tucked back into a prim bun, although a few strands hung loose at the sides of her face, curled slightly with the humidity. Celice was nearly twice as tall as him, about as tall as his owner, and her proportions were more owner-like as well—even Neopets of the same species could vary widely in size and physiology. She was always a snappy dresser, and today she was wearing robes of rich purple and gold, with a fur-lined cape to keep out the cold. He leaned back in his seat. “Good,” he said in the vaguest fashion possible. “That’s in three months,” Celice said. Pharazon smiled. “Thanks.” As much as he wanted to get back to his home as soon as possible, spending the week with Celice did sound like fun. If she was going to make him come all the way out here, he might as well enjoy himself after they got her chore out of the way. He looked out the window at the shops and businesses passing by. They were headed straight into the heart of Brightvale’s capital city, and traffic began to slow down accordingly. It was even slower on this wet day. “You’re sure this is a minor occurrence?” he asked Celice, looking back at her. “I have,” Pharazon said honestly. Which was to say, he had thought about how he didn’t want to study it. Pharazon’s jaw tightened and he pressed his back into his seat. “What if I don’t want to use it?” he asked quietly. The Draik’s tail swished anxiously and he drew his knees up to his chin, unable to meet her gaze. Every time they talked about this he could feel a strain on their friendship, and he wished she would change the subject. An awkward silence passed between them before Celice cleared her throat and pointed out the window. “And here’s Brightvale Castle. We’ll get you situated in the guest housing. Where would you like to go for supper? The food court or a local place?” She was smiling, but it didn’t quite reach her eyes. Brightvale University was the largest and most prestigious learning institution in Neopia, and it made sure its campus reflected that position. Brightvale Castle itself served as the main building, although the campus also sprawled to one side of the palace, and the castle town itself generally revolved around university life, catering to the needs of the students and faculty. The central hub of the school was the atrium in Brightvale Castle’s east wing. It consisted of four storeys of terraces, connected by a network of bridges, which housed all manner of shops and services from book stores to apothecaries. 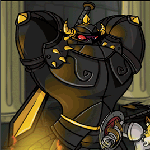 And capping it all was an enormous stained-glass dome that depicted various prominent scholars in Brightvale history, reminding Neopets of what they could achieve with the knowledge they gained here. The fourth storey was completely dedicated to food. Vendors cooked cuisine from every Neopian land to give anyone a taste of home—and show off the culinary department’s skills. Once purchased, meals were best consumed sitting by the large windows that offered a stunning view of Brightvale and the forests and mountains beyond. The setting sun made the rain look like curtains of dark smoke that smudged out parts of the landscape. “Remind me again why I have to go along, then,” Pharazon said as they shuffled past occupied tables, “if everyone’s convinced this is no big deal.” The steaming bowl of Chunky Cauliflower Soup on his tray wisped its tantalising aroma into his nostrils, making his mouth water. “I mean, I don’t see how I’m going to be any help—“ Distracted by the soup, his foot caught on the leg of a chair and he stumbled, barely managing to keep his food on his tray. “Hey, watch it!” someone barked. Pharazon turned to see a scowling blue Chia in the chair next to the one he had tripped over. She moved to hover protectively over that chair’s occupant. It looked like a brass typewriter with too few keys, and on top, instead of a paper-holding carriage, a loop of metal stuck out like some sort of Virtupets antenna. By this point Celice had noticed Pharazon was no longer following her, and she returned to loom over his shoulder like a protective older sister. “A hex generator?” She quirked an eyebrow. “But how do you know the codes?” Pharazon asked. “You didn’t quite think that far ahead, did you,” Celice said. “Yeah… okay.” Pharazon sipped at his soup, determined to remain unconvinced. The Draik managed a small smile back. “Okay.” He figured as long as she wasn’t expecting him to enroll in the Magic Academy as a result of this, he would at least be able to enjoy spending time with his friend. He thought his worries were over. He couldn’t have been more wrong.